I’d like to say straight off that I’m not a vet, also that to read this post properly you will have to click on a lot of links and read the material sourced at other sites in order to make up your own mind about this story. Anyone who is a vet is welcome to chime in and tell me if I’ve gotten something wrong, or been unintentionally misleading. Several newspapers and media outlets are currently featuring the story of Minxy, a miniature horse recently born in Cornwall, whose owners are appealing for donations to raise £6,000 for operations on Minxy’s legs. Here is a high-quality miniature horse foal for sale for £2,000 on the British Miniature Horse Society’s website. Notice that it “does exactly what it says on the tin” – i.e. it looks like a horse shrunk with a ray gun. Its legs are relatively long for its body, straight and well-conformed. Now look at Minxy. And Minxy without his splints. About £1,600 has already been spent on vets’ bills splinting Minxy’s legs to help straighten them and wrapping them in bandages each day. As others have pointed out, Minxy’s legs are not twisted because Minxy was premature. Minxy’s legs are probably twisted because Minxy suffers from dwarfism, and he was probably born early because Nature tries to press “eject” on pregnancies that are going awry. If you’re in the UK you can watch footage of him trying to walk here. “Minxy also has problems with his throat. His teeth are growing to the back of his mouth and could block his airway, so he will need an operation to fix that,” she said. This is a complication of brachiocephalism, the feature of dwarfism that gives Minxy that bulge-y “My Little Pony” head and curves his muzzles down like a beak or a claw. He’s reportedly already had pneumonia twice in ten weeks of life. This site claims that the mortality rate for miniature horse foals in the USA is one in three; with due care and attention this can be reduced to one in ten. Needless to say, this is still ridiculously high. 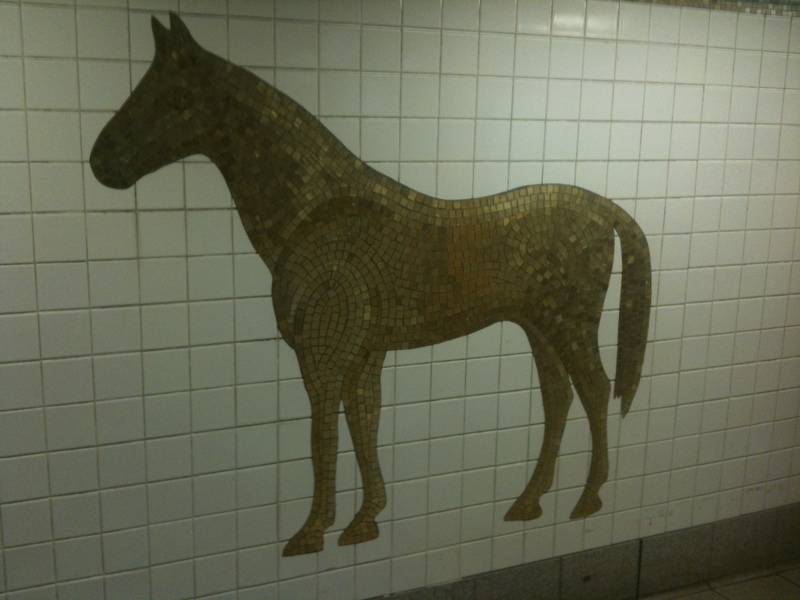 Here’s a memorial site for dwarf horses produced by US breeders. Notice that most of them live a few months at most. So, what does the future hold for Minxy if he doesn’t succumb to another bout of pneumonia and end up like the poor wee things in Horsie Heaven? Here’s a pony like Minxy being kept in an equine “wheelchair”. Here’s another dwarf mini called Koda between his leg and skull operations, doing well, it seems, although whether his deformities were as severe as Minxy’s is unclear. He appears to be leading a relatively normal life. Once again, however, this is a numbers game, because horses have a poor survival rate with general anaesthesia. 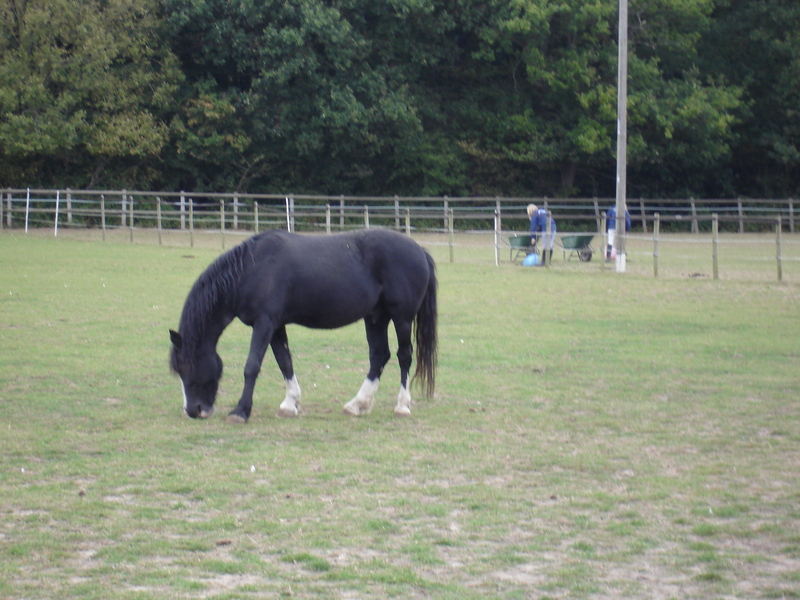 For a pony like Minxy who is already very sick, the odds of surviving repeated operations are pretty poor. Furthermore, the recovery period is crucial. Horses’ digestive and respiratory systems have evolved to function best when the horse is moving more or less constantly. In the wild, horses spend very little time either on their sides or immobile (they sleep for only 3 hours out of 24, and usually stand to do it as the weight of their internal organs is not well supported when they are prone), and horses recuperating from leg operations usually spend time in cross ties or even slings to immobilise them. The most famous recent example is the American racehorse Barbaro who broke down catastrophically and publicly in the 2006 Preakness Stakes. Wikipedia has a blow-by-blow breakdown of his subsequent operations and the eight months he spent being treated for the complications resulting from that initial treatment. One operation turned into many, and the horse finally had to be euthanized when three his legs became laminitic as a result of taking the weight for his injured right hind leg. So, what do you think Minxy’s future holds? Incidentally, the UK currently has a surplus of native ponies, which I’ve written about here, here and, in most detail, here. 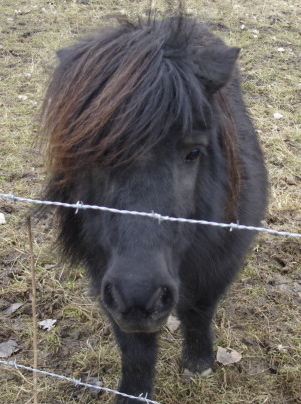 In February the Mail reported that dead ponies were found on Bodmin Moor, not far from Minxy’s home. It would cost a lot less than £6,000 to snap up some ponies at UK markets, worm them, feed them and train them up till they had some value and were less likely to be sold for zoo meat. Dartmoors, New Forests, Welshies and Exmoors may not be the smallest ponies in the world, but I think they’re pretty damn cute. UPDATE: Minxy was put down in early August, on vets’ advice. Don’t forget to leave an apple, some beer and a candle out for Epona, the goddess of ponies! Alternatively, enter her virtual shrine here. Goodness knows, Britain’s ponies could do with the help: Dartmoor Hill Ponies, Welshies and now even New Forest ponies are being hit hard by the recession.